Wow! I'm happy! Thanks for all the very nice comments!! WOO HOO!!!! Outstanding!!!! What an outstanding shot! Congrats! Great shot! Congratulations on a top five and a fantastic capture! I am sooooo proud of you! Great job! Terry - huge congrats on your HM! This is a beautiful shot! I love the sense of depth produced by both the clouds and fences. Very nice sky, lots of shape and texture...congratulation on the HM! Very beautiful! Congrats on top 10. Wow! What a gorgeous shot. Big congrats on top 10. This reminds me of a very peaceful place in the middle (or northeast corner) of Iowa. I like the leading lines of the fences, and the tree being just off center keeps my eyes from zeroing in on it too much. And CONGRATS on the 5th place finish!! Congrats on your awesome finish! This is gorgeous how you framed it, with the winding fence taking you deeper into the shot. And those clouds! Congrats on 5th place!! Great job capturing that sky! Seems to just go on and on forever! What a wonderful piece of scenery - this photo illustrates well how man can add to the beauty of an area - without the appealing fences, this would be a very dull scene. Nicely captured. Amazing, the clouds look so surreal. you mastered capturing this difficult lighting very well. I noticed the clouds more because they are so dramatic. in the landscape... although the fences do add to the photo somewhat... for the most part i have not preferred the 'builtscape' in most of the photos in this challenge. I like the fence and clouds that lead the eye into the photo. Nice anchor with the tree. 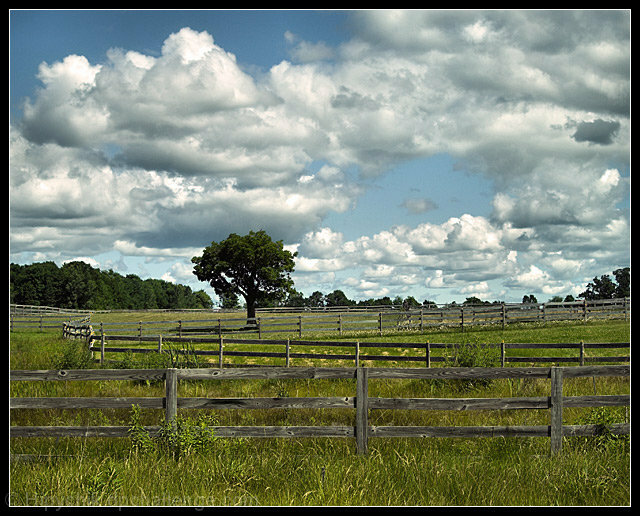 The zigzag of the fence is wonderful with the tree alone in the field and the clouds. Originally gave it a 7 - I was a dunce. It deserves more. Upping the score. Love the lighting, fence angles, tree, and sky. Very, very nice. Proudly hosted by Sargasso Networks. Current Server Time: 04/19/2019 01:15:31 PM EDT.